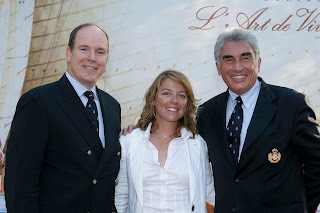 Yesterday, HSH Prince Albert II was on hand to see off 30-year-old sailor Alexia Barrier who left the port of Monaco to start a voyage around the world, on her own, to benefit her project called "4myPlanet". The intended purpose of the voyage is to raise money for research and technology to combat global warming/climate change. The Sovereign Prince met with Barrier and her family, gave her an Albert II Foundation cap before seeing her on her way to circumnavigate the globe for the cause of the environment. Today the Sovereign Prince was in southern France to help promote advances in the use of nuclear energy and recent advances in that area. Evidently the record cold temperatures of much of the world have not dampened the Prince's devotion to combating global warming.